It recognizes a 56kDa protein, which is identified as Early Mitotic Inhibitor-1 (EMI1). It regulates mitosis by inhibiting the anaphase promoting complex/cyclosome (APC). Emi1 is a conserved F box protein containing a zinc-binding region essential for APC inhibition. The Emi1 protein functions to promote cyclin A accumulation, S phase entry in somatic cells by inhibiting the APC complex. At the G1-S transition, Emi1 is transcriptionally induced by the E2F transcription factor. Emi1 overexpression accelerates S-phase entry, can override a G1 block caused by overexpression of Cdh1 or the E2F-inhibitor p105 retinoblastoma protein (pRb). Depleting cells of Emi1 through RNA interference prevents accumulation of cyclin A, inhibits S phase entry. Anti-Human EMI1 Positive Control Sample: HeLa, 293 or HepG2 cells. Ovarian carcinoma. Anti-FBXO5 antibody staining is expected to be primarily localized to the nucleoplasm. Variations in EMI1 antibody staining intensity in immunohistochemistry on tissue sections are present across different anatomical locations. An intense signal was observed in cells in the tubules in kidney and Purkinje cells in the cerebellum. More moderate antibody staining intensity was present in cells in the tubules in kidney and Purkinje cells in the cerebellum. Low, but measureable presence of EMI1 could be seen inadipocytes in mesenchymal tissue, bile duct cells in the liver, cells in the granular layer in cerebellum, cells in the red pulp in spleen, cells in the white pulp in spleen, decidual cells in the placenta, endothelial cells in the cerebral cortex, exocrine glandular cells in the pancreas, follicle cells in the ovary, glandular cells in the appendix, cervix, uterine, fallopian tube, parathyroid gland, prostate, salivary gland, seminal vesicle, small intestine, stomach and thyroid gland, glial cells in the caudate nucleus and hippocampus, hepatocytes in liver, islets of Langerhans in pancreas, lymphoid tissue in appendix, myocytes in heart muscle, neuronal cells in the hippocampus, neuropil in cerebral cortex, ovarian stroma cells in the ovary, squamous epithelial cells in the cervix and uterine. We were unable to detect EMI1 in other tissues. Disease states, inflammation, and other physiological changes can have a substantial impact on antibody staining patterns. These measurements were all taken in tissues deemed normal or from patients without known disease. 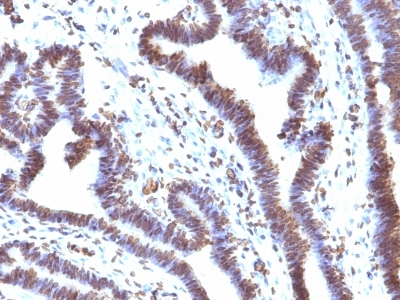 Tissues from cancer patients, for instance, have their own distinct pattern of EMI1 expression as measured by anti-EMI1 antibody immunohistochemical staining. The average level of expression by tumor is summarized in the table below. The variability row represents patient to patient variability in IHC staining. enQuire Bio's EMI1 Anti-Human Monoclonal is available for Research Use Only. This antibody is guaranteed to work for a period of two years when properly stored.